This report marks the end of a series of three big trains of thought. The first explained how we’re living through the Mother Of All Financial Bubbles. The next detailed the Great Wealth Transfer that is now underway, siphoning our wealth into the pockets of an elite few. In terms how this will all end, we favor the scenario put forth by Eric Janszen in 1998 called the Ka-POOM theory. 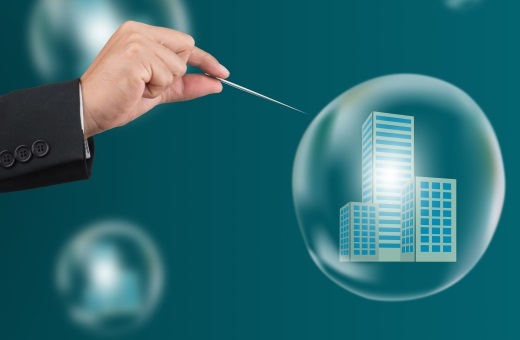 This theory rests on the belief that the Federal Reserve along with the other world central banks looked at Japan's several decades of economic stagnation and decided that deflationary recessions are to be avoided at all costs -- even if that means blowing asset bubbles and then cleaning up the destruction left behind in their aftermath. Because the Fed, et al. have a limited playbook (which is: print, and then print some more), the Ka-POOM model calls for limited periods of disinflation, followed by massive money printing sprees that then produce high inflation. Remember: inflation is simply “too much money chasing too few goods.” We can detect today's excess of money in the rising prices in our cost of living -- but those higher prices are symptoms, not causes. Inflation is not "higher prices". Inflation is "too much money". Next, inflation is not an evenly-distributed event. It’s not like the price of everything rises 10% at the same time. The inflation rate is an average, which contains some prices going up, while others stay flat or even go down going down. It’s always a lumpy experience. The reason why is that money is not evenly distributed across the economy, and it doesn't always chase (or desire) the same things. So the Fed and other central banks have printed up trillions and trillions of dollars, euros and yen, which they then essentially handed over to the financial markets and the very few people who work within them (as well as their biggest clients). As a direct consequence, we’ve seen enormous inflation in the prices of things that relate to that tiny universe of people – stocks, bonds, trophy city apartments, Gulfstream 5 jets, fine art, and rare gems. These items have all gotten massively more expensive over the past decade. Just as would have happened if the Fed had printed up a trillion dollars and given them everyone living in a trailer park in the American South, with the restriction that the money could only be used to buy other trailers in the region. Do you have any doubt that the price of trailers in the South wouldn't explode upwards? Well, that’s exactly analogous to what has happened to financial and trophy assets. The amount of money created and poured into the financial markets by that central banks has been incredibly enormous. As a first-order event, it raised the prices of nearly all financial assets. And then, as a second-order derivative, it then flowed into the properties and cherished possessions of the financial industry insiders. The summary is that we’ve already had lots of inflation – but it has (so far) been mostly contained to the areas where the freshly-printed money was first directed. No surprise there. But it's certainly not only been limited to the rarified items the rich enjoy. Anyone who is currently looking to purchase a home, car or college education has a pretty good idea how prices have jumped substantially over the past decade. Here’s the thing about the attempts by central banks to circumvent the workings of the actual economy by simply printing up money: It is doomed to fail. It always does; one cannot simply 'print up' prosperity. Printing up money merely creates the illusion of free wealth for those with first access to it. In reality, what happens is that it secretly transfers the wealth from everyone else to those lucky few. The Fed and the rest of the central banking cartel are consciously and very pointedly picking winners and losers. It’s not in their power to make everyone a winner. So they have decided to throwing granny (and savers and pensions) under the bus while financial elites and well-connected speculators (e.g. JP Morgan and other large banks) extremely wealthy in the process. Wealth is being transferred from Parties B-Z to Party A – from the many to the few. What the Fed promised would happen along with all of this money printing has not materialized. 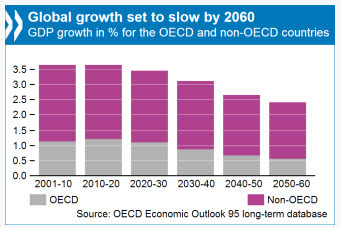 There has been no return to rapid economic growth. And there won't be, because we have massive structural problems in our economy that can't be papered over forever. This stark fact makes the Fed's entire money printing misadventure not just pointless, but dangerously destabilizing from a social and political perspective. The world's central banks, especially the Fed, have done an enormous amount of damage. These institutions, as well as the decision-makers within them, are going to have a heck of lot to answer for when the inevitable crack-up comes. And so here we find ourselves, at the final torturous, grinding part where the final bubble top is formed. The über-bubble. The Greatest Of Them All. A bubble this spectacular requires a top worthy of its size. A long, massive top, full of increasing exuberance -- until the very last investor is sucked in. Where I’ve noted humans’ remarkably silly behavior during bubble episodes in the past – tulip bulbs, railroads, swampland - I still struggle to understand or even explain this one. It’s so obvious at this point. And yet, like its brethren bubbles of the past, a lot of otherwise thoughtful and careful people are getting sucked in by its siren song. I guess the best economic description of it might be “a credit bubble” with sub-components like sovereign and household debt, and sub-sub-components like Toronto real estate and the IPO price for SNAP shares (that’s Snapchat, which soon after its launch, had a valuation of $40 billion. This mind you, is a company that has no identifiable revenue model). You have to be quite delusional to think that debt can be compound at twice the rate of income forever. Unfortunately, there are more than a few of those ungrounded optimists working in central banks and governments the world over. Their thinking is simply, The sky’s the limit! Those of us living in reality find this mindset puerile and insulting. And, of course, dangerously reckless. And it’s also maddening to hear the media cheerleaders for Wall Street selling us this bunk as if it were somehow sensible. It is not. Look, millions -- likely billions -- of people are at risk of getting badly hurt. When this bubble blows, it’s going to be enormously destructive and take out a lot of wealth along the way. Millions of jobs will be destroyed. What people think of as wealth will evaporate as though it never existed in the first place (it didn’t). Political dynasties and major financial institutions will be ruined. The summary here is this: We are still printing and borrowing enormous amounts of money and credit, but the world is not growing any larger in response. The pressure is building. Nobody knows when all of that money and credit will have to be 'trued up' against the amount of real stuff out there. But it will. History shows us that it always does. And that moment will be referred to by most as a period of wealth destruction. 401ks will be shredded, bonds will become worthless, defaults will spike, institutions and entire countries will fail - but the truth is that all of that paper 'wealth' was an illusion. People's faith in it had been betrayed long before, when those in power started abusing the system by creating too many tertiary claims. After the dust settles, there will be winners and losers, and those with the proper framework will understand that what actually happened was that all of the wealth was transferred from those who thought they owned it, to those who actually did. The biggest remaining question is whether the wealth transfer comes about in the form of an inflationary destruction, like in Venezuela today, or as a deflationary bust more in the fashion of Greece. The only thing that capable of preventing this coming carnage would a resumption of rapid economic growth. 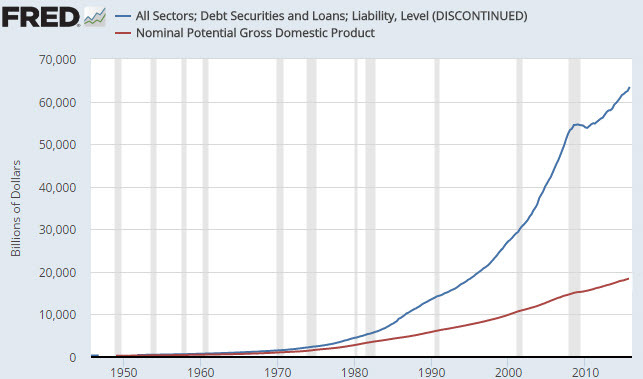 And I mean growth that exceeds the rate of debt creation. But that's simply not going to happen. We can dispense with the idea of “solving” our too-much-debt problem by a resumption of rapid economic growth either by deduction or observation. Both work just as well on their own, but each tells a similar story in this case. The deductive route notes that economic growth stimulated by ever-higher amounts of borrowing simply requires greater and greater debt loads to accomplish. Eventually debt levels simply become too high, and pinch off growth. We can also deduce that because economic growth is tightly linked to energy consumption, lower amounts of usable energy flowing through an economy will cause that economy to stall out as well. Because we know that both the quantity as well as the net yield we get from our energy-producing activities are flattening, this explains why GDP growth is flattening too. Thus, from a deductive standpoint, combining what we know about high levels of debt and flattening energy returns energy there’s really no more room for confusion about why GDP growth is, and will remain, anemic (at best). Notice that the last year of data, 2016, is coming in at the lowest reading since the Great Recession, while the next two years are estimated to also come in at less than 3%. 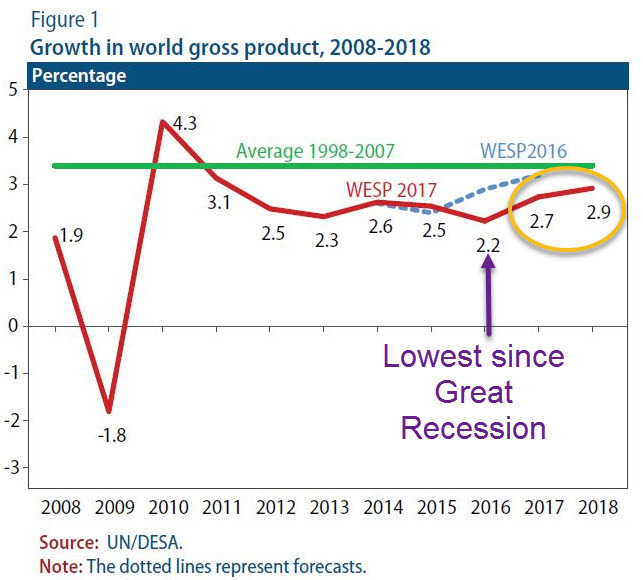 The world hasn’t averaged 3% GDP growth in a decade. Even the mighty US has gone more than ten straight years without breaking into the 3% range. We have to ask: How many years does it take to finally admit that there’s something seriously wrong with our hopeful story line that robust growth is going to save our debt-ridden bacon? Each of those colored lines is a forecast. Each of them foresaw growth going notably higher in the near future. Not only was every one of them utterly wrong in direction, each failed at getting even the next quarter anywhere close to right. See how none of those lines ever dips below 3%? 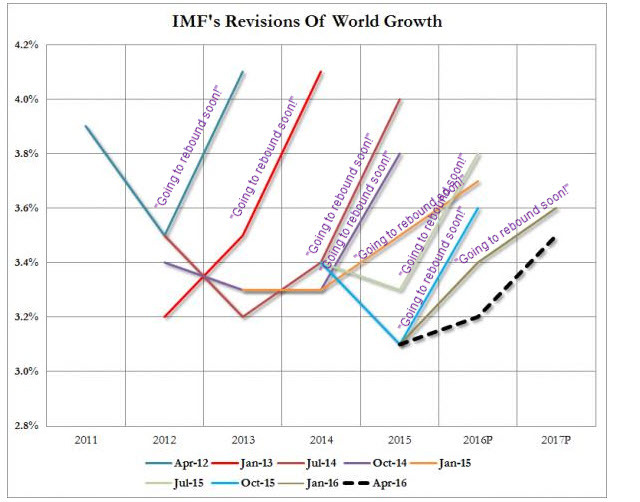 See in the prior chart how global growth never breached 3% in any of these same plotted years? My ‘prediction’ is that these projections will turn out to be far too high. Mainly because I include declining net energy in my views and no mainstream economist ever does. But the track records of these outfits shows that taking the ‘under’ side of the over/under bet offers incredibly safe odds. At any rate, the main story here is that the only way we can begin to justify the astronomical levels of debt currently on the books, let alone slathering on new tranches just to keep the whole thing form imploding, is to have a story of endless, rapid future economic growth. Which is, we've already shown, a delusional fantasy. Stagnating growth, ever more trillions of debt, and a finite amount of depleting net energy all adds up to an unsustainable mess. With asset price bubbles everywhere and wealth transfer mechanisms already in place, the end-game involves a very few winners and a lot of losers. Anything that is this unsustainable will someday end. But how? And how should we position ourselves for it? In Part 2: The Ka-POOM! Survival Guide, we detail in depth the most likely progression predicted by the Ka-POOM! model. First, a punishing crash in prices as natural market forces eventually overwhelm the Fed's doomed efforts to print the world to prosperity. Think of the 2008 crash, but on steroids. Then will come the inevitable response from the central banking cartel: Set the printing machines on maximum speed! While this may seem to work for a brief while, it will soon collapse the world's currencies in a hyperinflationary deluge. This will be a very tricky time for preserving wealth as things swing violently from disinflation to inflation. Understanding the mechanics and knowing what to expect will be critical -- not just for safeguarding your money, but for taking advantage of what will surely be some of the best bargains of our lifetime.